This young lady is galavanting around Europe with Iowa Ambassadors of Music currently and prepping up a storm for All-State auditions this fall. Last time around, she made it to recalls with a broken wrist in a cast, so I've got all fingers crossed that she makes it this year without injury! A lot of times, as teachers, we learn just as much as we teach from our students. Allie has been one of those students who has pushed me to get better at my own clarinet playing, because as a middle schooler, her clarinet abilities challenged mine! Playing next to her when she was in 7th grade, my jaw often wore out before she did and her senior session was no different. Allie taught me the difference between "ears" and "no ears" on her Arabian, Shady, and I know my shoes were soaked to their core long before her more appropriate boots were! We rescheduled her session in anticipation of a torrential downpour. Then, the evening of our shoot, we got another deluge, that thankfully let up just in time for our shoot to start. The horse pasture was sopping wet, but neither that nor an ornery Shady would prevent us from getting great shots. 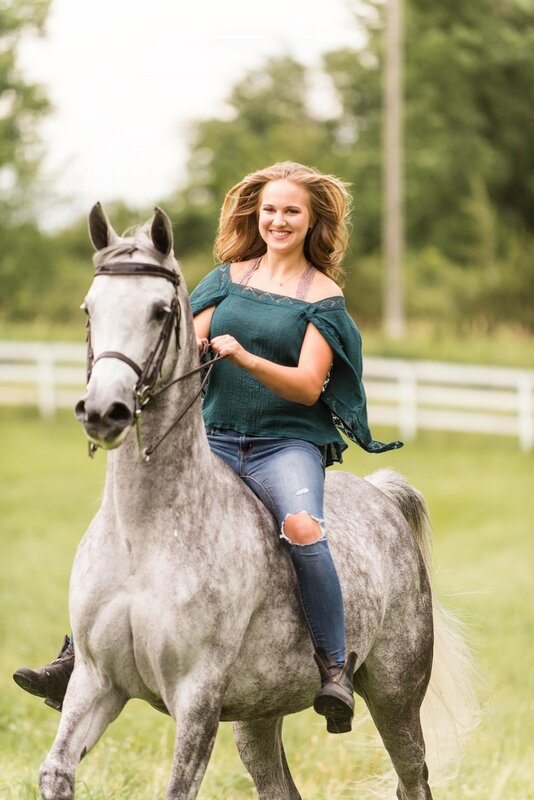 Please place another check mark by my photographic Bucket List of "Full Senior Shoot w/Horse"! After an hour long shoot with Shady (who we sometimes joked was like corraling a toddler to get her ears up and at the right angle to me and the camera!) we switched gears to showcase her musicianship prowess and dare I say, outstanding outfit choices. Allie: Your clarinet abilities have morphed and changed so much since you first walked into my office. But I'm so thankful that your nose scrunch laugh and devotion to "getting it right" hasn't! Be it getting the right notes, rhythms, or whipping your horse into shape to obey, you were fully committed to making these photos the most awesome ever and I hope these meet or exceed your expectations! I'm definitely loving the bloopers too, but Allie, you are one of a kind and I know you will take the world by storm no matter what you decide to do beyond Norwalk's hallways. PS You can view more of our time together (and some bloopers) HERE.